However, the question becomes, how about when you have to use custom third party components. While we cannot guarantee the product will work with every single third party component, nor can we offer support for components that we have not authored, we certainly can show you how this can be done with a sample component. 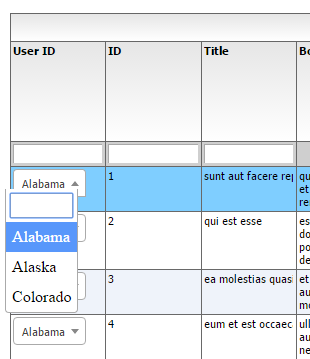 For this example, we are going to use the powerful and very popular select2 jquery auto complete component. flexiciousNmsp.UIComponent.apply(this,["div"]);//second parameter is the tag name for the dom element. * The data property points to the item in the grids dataprovider that is being rendered by this cell. * This is important, because the grid looks for a "setData" method on the renderer. * In here, we intercept the call to setData, and inject our logic to populate the text input. var column = cell.getColumn();//this is an instance of FlexDataGridColumn. * property that points back to the original domEvent. //in the renderer, you have the handle to the cell that the renderer belongs to, via the this.parent property that you inherit from flexiciousNmsp.UIComponent. this.data[column.getDataField()]=this.select.value;//we use the dom element to wire back the value to the data object. //This sets  the inner html, and grid will try to set it. Since we are an input field, IE 8 will complain. So we ignore it since we dont need it anyway. We are defining an itemRenderer here, that simply wraps a select2 component. In its constructor, we initalize it.